On Saturday 9th June, between 11 am and 5 pm, Bawburgh will once again open its gardens to raise money for the village. This event needs your support to make it successful. We need people to open their gardens and show the visitors what an amazing place Bawburgh is. It doesn't matter if your garden is a work in progress (aren't they all? ), letting people see what you have done or how you intend to get there is all part of the fun and raises much needed funds for the village. We also need people to help at the Village Hall on the day, selling tickets or helping to set things up. If you can spare some time, even just an hour will help, or are willing to open up your garden, Sharon or Saskia would love to hear from you. 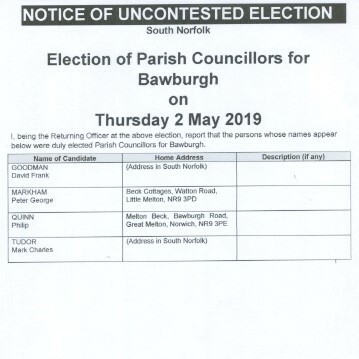 Let's make the 2019 Bawburgh Open Gardens event the best ever! 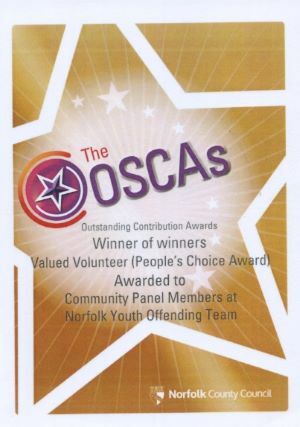 On behalf of the Community Panel Members of Norfolk Youth Offending Team, can I thank all of you who took the time to vote online for this award nomination. Amazingly we won the OSCA overwhelmingly and are all very proud of our achievement.